The judge for the August competition was the competition organiser, Andy Fowlie. This month's entries were again of a high standard with some entries highlighting the Challenge Tour event, a number of "action shots" capturing members mid-swing and some great views of the course either first thing in the morning or last thing at night. It was not easy to choose the winners and the decision took some time... but in the end there were three pictures which I liked more than the others. 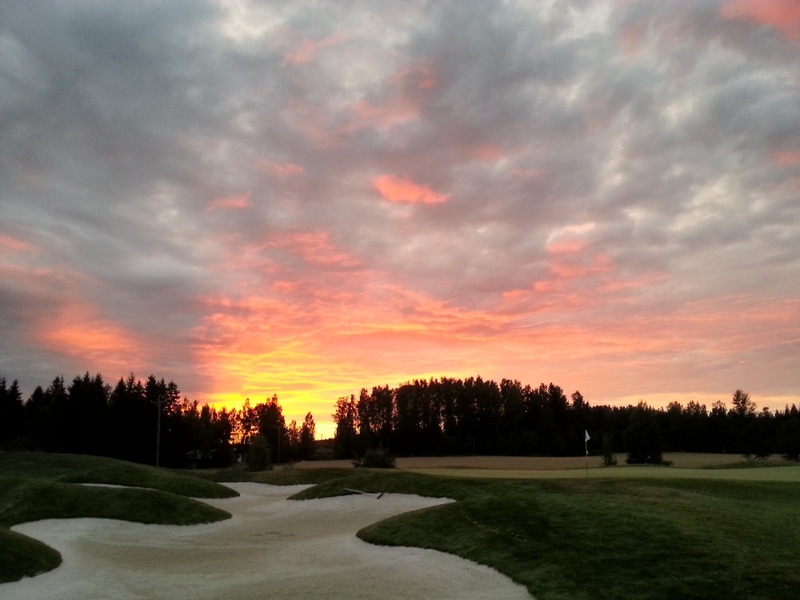 This picture, taken in the evening, features an amazing red sky as the backdrop for the 3rd hole and showcases the huge bunker to the left of the green on this par 5. For the third month in a row Mari has managed to take one of the winning pictures. 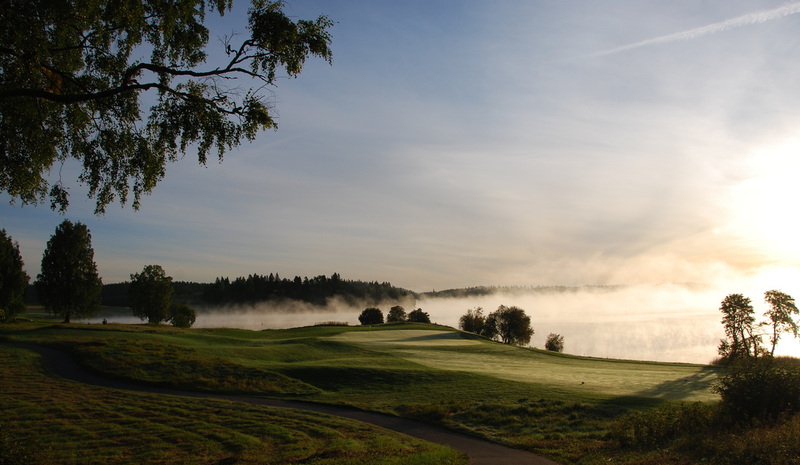 This picture, taken early in the morning, captures the amazing scene as a ghostly mist rolls in across the lake. Mari took a number of other excellent pictures this month and while this was the only one to make it to my top 3, she might have had 3 in my top 5. 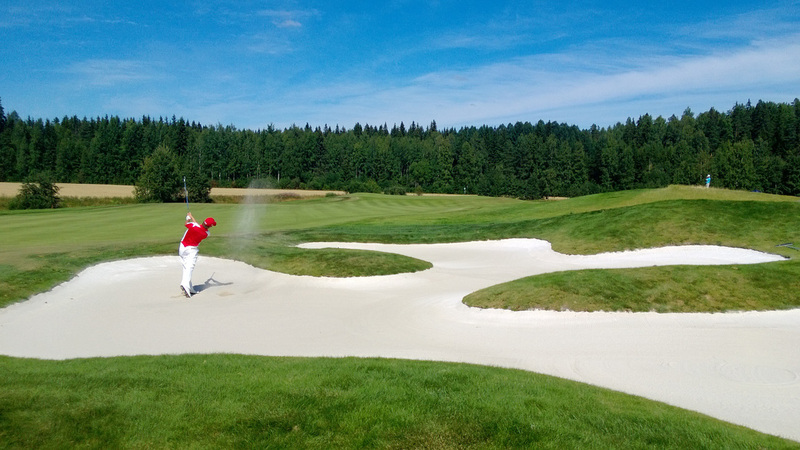 Having selected two photos which capture the beauty of the course, I wanted the third one to be a reminder of what the course is for - playing golf. In this picture, taken by Timo Kankuri there are a few things which I particularly like. Firstly, the picture is taken at just the right moment in the player's swing. I am not able to see the ball in the picture, but the swing looks just right and I can imagine the ball soaring towards the green. Looking at the details of the picture, the course looks to eb in perfect condition, the bunker is immaculately raked and the stripes on the fairway indicate that it has been recently cut. While the other two pictures were taken in the evening and the morning, this one is in the middle of a beautiful day. The three pictures each go through to the final at the end of the season. The rest of the entries during August can be seen below.